A significant proportion of the published research evidence in homeopathy lies within the archived pages of this journal. For randomised controlled trials, for example, articles in Homeopathy plus the British Homoeopathic Journal comprised 32 out of a total of 164 (19.5%) peer-reviewed publications that were the subject of a major literature review published in 2013. Given the position of the journal as the only Medline-listed periodical specialising in homeopathy, this situation is as it should be. That its Impact Factor increased in the last year to its highest ever level (1.524) is testament to the high intrinsic quality and the importance of its published content. In the eclectic world of homeopathy research, such quality and impact involve contributions from a vast range of disciplines, such as mammalian and plant biology, physics and chemistry, immunology and pathology, epidemiology and public health. Each issue of this journal, therefore, presents a diverse mix of scientific discovery. Its readership is large and growing. Its reach, based in the membership of the Faculty of Homeopathy together with institutional and individual subscriptions, is truly international. Given the rich scientific content, it is sobering to reflect on how much of the journal is read and deemed relevant outside the world of homeopathy. How penetrating is its reach? From this issue of the journal, for instance, we might wonder how many epidemiologists learn about India's proactive health programme, ‘Homoeopathy for the Healthy Child’, or how many oncologists notice that homeopathy can help cancer patients cope with their disease and improve their well-being. Will general medical practitioners become aware that their homeopath counterparts are striving to improve therapeutic success through prospective identification of ‘best cases’? The world's immunologists may remain mainly oblivious to the finding that ultra-diluted arsenic can affect interleukin-6 production in macrophages (a result not explained by silicon leaching from glass or plastic containers), and that homeopathic treatments can influence genetic expression of pro-inflammatory mediators in fish. Will the effort of Russian scientists to identify new medicinal plants touch a wide readership of botanists? Any disconnect can presumably be blamed on ‘plausibility bias’ against homeopathy—a term coined by this journal's late and greatly esteemed Editor-in-Chief, Peter Fisher. 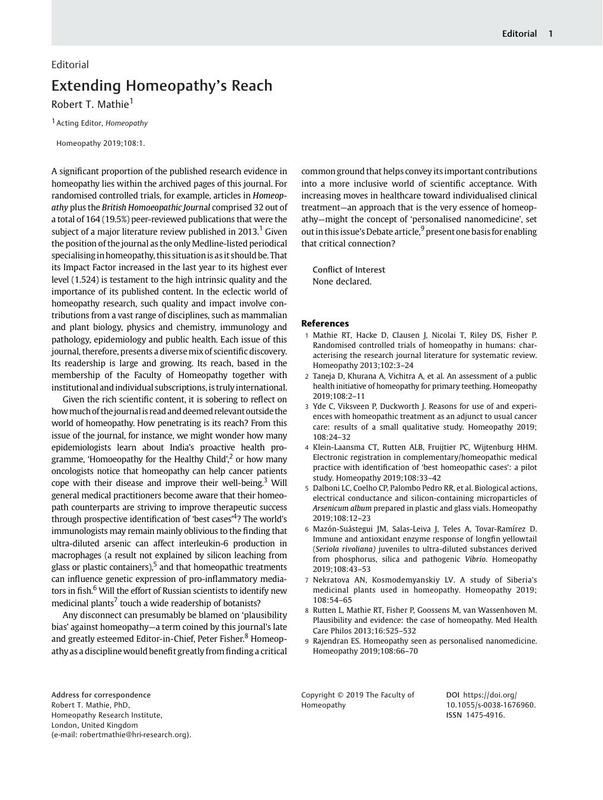 Homeopathy as a discipline would benefit greatly from finding a critical common ground that helps convey its important contributions into a more inclusive world of scientific acceptance. With increasing moves in healthcare toward individualised clinical treatment—an approach that is the very essence of homeopathy—might the concept of ‘personalised nanomedicine’, set out in this issue's Debate article, present one basis for enabling that critical connection?